Schaumburg, IL – February 6, 2018 – During NPE2018, Plustech, Inc., Sodick’s IMM Division, will be introducing the OPM250, Metal 3D Printer along with four new injection molding machines models: the MS100 New Electric Horizontal Molding Machine, the LP20VRE Micro Vertical Molding Machine, the GL60A Horizontal Molding Machine, and the GL30A-LP Micro Horizontal Molding Machine. Sodick will demonstrate their ultra-precision molding capabilities, advanced molding controls and monitoring systems, along with their new IoT solutions. The OPM250, Metal 3D Printer, is a single process machine which combines laser metal sintering and high speed milling within the same workspace, allowing users to create finished 3D printed molds within a single machine. Sodick’s additive technology improves mold cooling channels and cycle times and streamlines mold design, significantly reducing the number of components necessary to create a complete mold, resulting in operational savings. The MS100 is a new 100-ton Electric Injection Molding Machine. 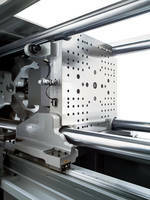 The machines new toggle design clamping mechanism contributes to faster cycle time and energy savings. This model is Sodick’s first Electric Molding Machine. During the show, the MS100 will demonstrating a conformal cooling mold made by OPM250, and automated by Star Automation. The molded part is a printer ink cartridge housing, the demo will enable visitors to learn about the benefits of 3D cooling channels that reach closer to the surface of the mold – providing more even cooling, reducing deformation, and shortening cycle times. The LP20VRE is a 20-ton Vertical Injection Molding Machine with a rotary table designed for short cycle times with the most difficult micro overmolding applications. At NPE2018, Sodick wil be featuring a live demo of the LP20VRE. The demo will run eight-cavity micro-molded filter part, which was built by Mold Craft, and will include automation provided by Yushin America. During NPE2018, Sodick will be partnering with Beaumont Technologies. Beaumont will be putting on multiple on-site demos daily that will highlight their next generation Meltflipper test tool. The tool gives a direct comparison of parts molded with and without Meltflipper in the same shot. The balance on one side versus the other will be monitored though pressure traces using Sodick’s new cavity pressure monitoring system, connected accessories, and data logging system to host computer. It will be demonstrated on Sodick’s GL60A in an automated cell. The GL60A is Sodick’s ‘Global Platform’ 60-ton Horizontal Molding Machine. The GL30A-LP is Sodick’s flagship micro molding machine. This horizontal 30 ton machine will be on display in Technoject’s booth – W3883 running a HEITEC’s narrow pitch valve gated mold. All four models feature Sodick’s V-LINE® System which separates the plasticization and injection processes. This two-stage plunger system enables consistent measurement and injection, ideal for miniature / micro precision components, tight tolerance applications and advanced polymer applications. To see these machines, and more, in action, visit Plustech at NPE2018, May 7-11, 2018 in booth W782 at the Orange County Convention Center in Orlando, Florida. For more information on Plustech, Inc., and Sodick’s line of injection molding machines, please visit www.plustech-inc.com. ABOUT PLUSTECH, INC. – Plustech Inc. is the North American branch of Sodick’s Injection Molding Machinery Division. Based in the suburbs of Chicago, Plustech sells, services, and supports Sodick’s entire line of precision injection molding machines in the North American market.